The fortified house of Morteau is an invitation to go back in time until the end of the 16th century, deeply troubled by the Wars of Religion. It all began in 1594, when the squire Nicolas de Haut returned to Chaumont after a perilous pilgrimage of more than a year to Jerusalem where he was made Knight of the Holy Sepulcher. Coming from a family of notables Chaumont and attorney of the King, he joined the powerful Rose family by marrying Marguerite, niece of the bishop league William Rose. It lacks more than a trre and a castle: it is done in 1596, date at which it acquires part seigniory of Morteau and makes edify the fortified house which is still there today. But the bastioned plan, a main building surrounded by four diamond towers, does not only testify to the power of the new lord. 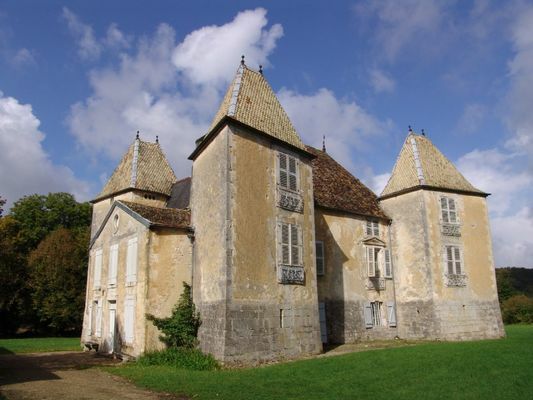 It recalls the defensive function of this strong house, attested by the thick studded door surmounted by a bretèche, the loopholes at the lower parts of the towers, the shooting windows or barred grilles on the west facade. The Edict of Nantes is not yet signed, the region remains unstable and easy prey for looters. Morteau defends and resists in the seventeenth century again, where the old village of Morteau, nestled around his church (now Chapel Saint Sulpice), is permanently destroyed by the Swedish mercenaries of the Thirty Years War (1618-1648). As an outward sign of power, Morteau reveals, however, a lord little attached to luxury and the pleasures of the world. The interior decor is sober, impervious to the refinements of the Renaissance. The vaulted rooms on the ground floor look both spartan and monastic. Manifestly animated by a strong faith, linked to the League by the commitment of Chaumont and his in-laws, the lord of Morteau leaves several testimonies of piety: it is Morteau he signs the story of pilgrimage to Jerusalem and preserved today at the National Library Reserve. But above all, he built at the top of the entrance tower a domestic chapel, consecrated in 1599 by William Rose. After the plague which raged in the region in 1636, his wife Marguerite Rose, who financed with his son Galaad the Jesuit college of Chaumont, has painted on the walls of the chapel of Morteau frescoes still visible today and dedicated to the Virgin and Saint Charles Borromeo, who was particularly famous during the plague of Milan in 1576. Thus Morteau says stone to stone the strengths and uncertainties of his time, the taste of power, violence, faith. Later, much later in the last third of the eighteenth century, Morteau the austere will be taken over by another master, the Count of Beaujeu who will try to give it another face and make it truly a castle. There is no review about Château De Morteau, be the first to leave one !